An easy scenic hike in downtown Roswell with rolling terrain, low elevation and scenery such as the covered bridge, two historic mill ruins and the Big Creek spillway dam. The in-town trail that’s out of town, Vickery Creek Trail is located near historic downtown Roswell. It’s the type of nature trail that is ideal for a post-work escape. The easy hike treks alongside Vickery (Big) Creek with modest rolling hills and a few historic sites. Choose from an outer loop or several smaller marked trails that crisscross through the middle of the nature area. Vickery Creek, also known as Big Creek, is a tributary of the Chattahoochee River, and the trails here follow the creek along steep banks and thick Georgia forest. Low hanging trees and vegetation line the trails, most of which are double-wide. 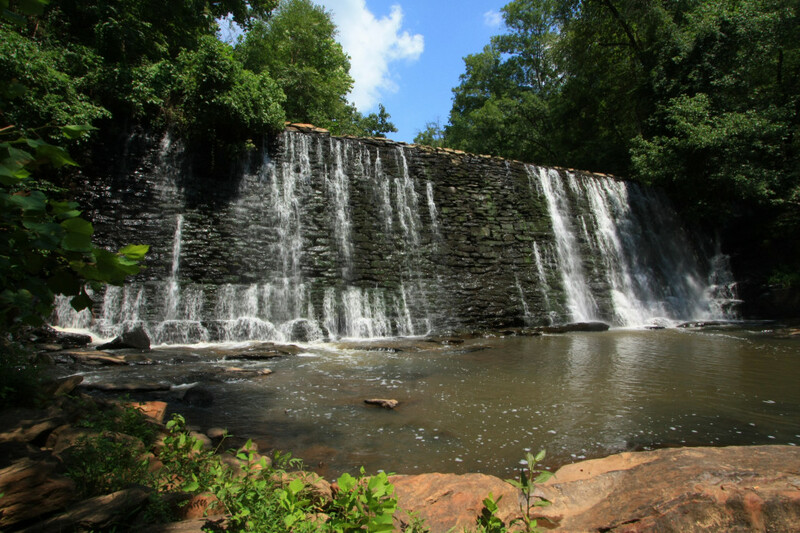 It’s worth taking the side trails to see the covered bridge, two historic mill ruins and the Roswell Mill spillway dam. Consider Vickery Creek trail one of those “choose your own adventures” and don’t let directions frustrate you. Follow the marked trail posts, labeled VC 1 to VC 30. The main outer loop is about 3 miles, but several intersections can guide you on paths through the middle of the woods, giving options to add on more mileage or shorten your hike. The South Atlanta Street parking lot sits on top of a knoll on the west bank of Vickery Creek. It is adjacent to the Allenbrook Historic House, and the ruins of the Roswell Mill, which was used to produce cotton for Confederate soldiers in the 1800s. To access the trail from this point, you’ll walk down a long staircase and cross the covered bridge. Peer over the edge to see the bubbling creek below. In warmer weather, descend the steep slopes to take a dip in the chilly rock-studded creek. Some river crossings are created with rusted pipes, which can act as a fun balancing act for those looking to cross. For the closest access to the dam, begin the hike at Oxbo Road. The hike starts alongside Big Creek before getting into the brush of the main trail. A bridge off to the side crosses the Hog Wallow Creek, and another smaller dam is near this trailhead, 0.5 miles off a side trail. Walk the trail clockwise from either Riverside Road or South Atlanta Street, and your first destination will be the Roswell Mill spillway dam. 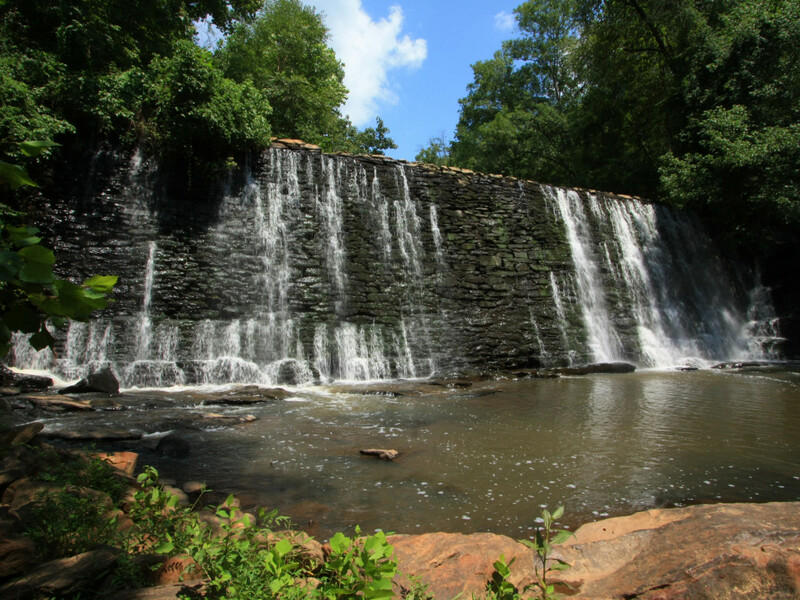 This dam powered the mill during the Civil War period, but now the miniature waterfall is a pleasant view on the hike. Like its name, the water spills down the deep grey bricks. Be sure to snap some photos from above the dam, or below on the rocks. In the summer, don't be afraid to take a dip. Whether or not you park at the South Atlanta Street lot, make that detour over the covered bridge to see the Roswell Mill ruins. With its Confederate history, the Allenbrook Historic House is a nice contrast to the woods. The creek provides a nice backdrop to the worn brick ruins. For an in-town trail, the terrain is a mix of pine straw, clay and sand. Due to the lower elevation profile, with a gain of no more than 100 feet, you’ll find the steepest sections to be short, but just enough to jump up your heart rate. With its historical views, minimal elevation, and short distances, this is a great trail for the family. Trail runners will find some of the roots and rocks a challenge that is well worth taking. A $3 parking fee is required for all vehicles. This is a strictly foot traffic trail, so no biking is allowed. Pets must be on a leash. In the summer, you’ll want bug spray, since the trail is so close to the creek. Finding the main trailhead on Riverside Road can be an adventure in itself, as it is tucked away near a residential area. Coming from the south, you'll take South Atlanta Street, turn right onto Azalea Drive and right onto Riverside Road. You can gain access to the trail at two other points as well: South Atlanta Street and Oxbo Road. If you continue down South Atlanta Street instead of turning at Azalea Drive, there is a parking lot to the left, down a steep hill. To access the Oxbo Road gravel lot, it is the furthest north on South Atlanta Street, where you'll turn right onto Oxbo Road.